NOAA plays a role in preventing accidental whale deaths by doing things like tracking the animals, operating a hotline for mariners who find distressed whales and providing permits that allow the rescue groups to respond to emergencies. Those functions are disrupted or ground to a halt by the shutdown, and that's bad news if whales need help, said Tony LaCasse, a spokesman for the New England Aquarium in Boston, which has a rescue operation. "If it was very prolonged, then it would become problematic to respond to animals that are in the water," LaCasse said. "And to be able to have a better handle on what is really going on." NOAA recently identified an aggregation of 100 of the whales south of Nantucket, nearly a quarter of the world's population, but the survey work is now interrupted by the shutdown, Asmutis-Silvia said. Surveys of rare whales are important for biologists who study the animals and so rescuers can have an idea of where they are located, she said. 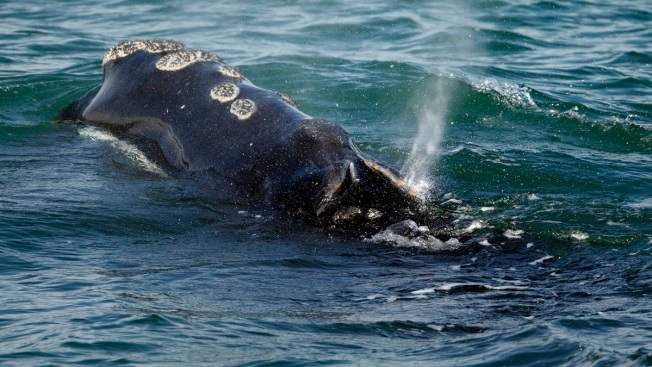 No right whale mortalities have been recorded so far in 2019, but there have been at least 20 since April 2017. "There's a really significant impact on marine mammal conservation based on this shutdown," Asmutis-Silvia said. "We have little to no ability to find them because of NOAA's being furloughed." Many in the conservation community are anticipating potential changes to federal government's Atlantic Large Whale Take Reduction Plan, which is a tool to reduce incidental deaths of whales. But that process, too, is on hold because of the shutdown. Scott Landry, director of marine mammal entanglement response for the Center for Coastal Studies in Provincetown, Massachusetts, said a NOAA whale entanglement hotline is currently being forwarded to him, and he's managing to pick up the slack so far. Rescue groups anticipated the shutdown and are working together to make do until it's over, he said. In Virginia, one of the state's first responders for whale rescues is the Virginia Aquarium and Marine Resource Center in Virginia Beach. Mark Swingle, the aquarium's director of research and conservation, said the center would not have "the usual assets we depend on to support the response" if it needs to assist an endangered whale. That's because NOAA staff and the Coast Guard would not be available, Swingle said. "These circumstances require extremely specialized training and resources and NOAA is the lead organizer of large whale and other disentanglement efforts," he said. "Live strandings pose their own set of challenges that NOAA helps navigate appropriately."